The Year 2000 problem (also known as the Y2K) was a notable one for both digital and non-digital documentation and data storage situations which resulted from the practice of abbreviating a four-digit year to two digits. While no globally significant failures occurred when the clocks rolled over into 2000, preparation for the Y2K bug had a significant effect on the computer industry. Many banks responded to the Y2K problems by forcing full four-digit year entries on cheque forms, which helped prevent the error from occurring in accounting environments. For a time, geo-political events and natural disasters indirectly related to the global oil market had strong short-term effects on oil prices, such as North Korean missile tests, the 2006 conflict between Israel and Lebanon, worries over Iranian nuclear plans in 2006, Hurricane Katrina, and various other factors. By 2008, such pressures appeared to have an insignificant impact on oil prices given the onset of the global recession. The recession caused demand for energy to shrink in late 2008 and early 2009 and the price plunged as well. However, it surged back in May 2009, bringing it back to November 2008 levels. The Enron scandal, revealed in October 2001, involved the energy company Enron and the accounting, auditing, and consultancy partnership of Arthur Andersen. The corporate scandal eventually led to Enron's downfall, resulting in the largest bankruptcy in American history at the time. Arthur Andersen, which was one of the five largest accounting firms in the world, was dissolved. Many executives at Enron were indicted for a variety of charges and were later sentenced to prison. Enron's auditor, Arthur Andersen, was found guilty in a state court, but by the time the ruling was overturned at the U.S. Supreme Court, the firm had lost the majority of its customers and had shut down. Employees and shareholders received limited returns in lawsuits, despite losing billions in pensions and stock prices. As a consequence of the scandal, new regulations and legislation were enacted to expand the reliability of financial reporting for public companies. Telecommunications giant WorldCom was mired in a fraud worth US$3.8 billion due to false financial reporting and subsequent US$11 billion loss to investors. The WorldCom scandal was, until the Bernie Madoff schemes came to light in 2008, the largest accounting scandal in US history. The CEO at the time, Bernard Ebbers, a Canadian citizen, was convicted of fraud and conspiracy in 2005. Mr. Ebbers is currently serving a 25-year prison term at Oakdale Federal Correctional Complex in Louisiana. Portfolio.com and CNBC named Ebbers as the fifth-worst CEO in American history. Time Magazine named him the 10th most corrupt CEO of all time. Parmalat is a multinational Italian daily and food corporation. Having become the leading global company in the production of UHT (Ultra High Temperature) milk, the company collapsed in 2003 with a 14 billion euro ($20 billion; £13 billion) hole in its accounts in what remains Europe's biggest bankruptcy. Parmalat’s CEO at the time, Calisto Tanzi, once a symbol of unlimited success, was arrested and revealed that he diverted funds from the company. Mr. Tanzi was sentenced to 10 years in prison for fraud relating to the collapse of the dairy group. The United Nations launched a political corruption investigation due to the scandal over its Iraqi Oil for Food programme. The programme, established by the United Nations in 1995 and terminated in late 2003, was established with the stated intent to allow Iraq to sell oil in the world market in exchange for food and other humanitarian needs for ordinary Iraqi citizens without allowing Iraq to rebuild its military. As the programme ended, there were revelations of corruption involving the funds. The Kyoto Protocol went into effect in February 2005 without the support of the United States and Australia. The Kyoto Protocol is a protocol to the United Nations Framework Convention on Climate Change (UNFCCC or FCCC), aimed at combating global warming. The UNFCCC is an international environmental treaty with the goal of achieving stabilization of greenhouse gas concentrations in the atmosphere at a level that would prevent dangerous anthropogenic interference with the climate system. The Protocol was initially adopted on 11 December 1997 in Kyoto, Japan and entered into force on 16 February 2005. As of November 2009, 187 states have signed and ratified the protocol. American investor, businessman, philanthropist and billionaire Warren Buffett donated over US$30 billion to the Gates Foundation, founded by Microsoft head Bill Gates and his wife Melinda Gates. Mr. Buffett is considered to be one of the most successful investors in history, the primary shareholder and CEO of Berkshire Hathaway, and (later) in 2008 was ranked by Forbes as the richest person in the world with an estimated net worth of approximately $62 billion. In 2009, after donating billions of dollars to charity, Mr. Buffett was ranked as the second richest man in the United States with a net worth of $40 billion. The years 2007 to 2008 saw dramatic increases in world food prices, creating a global crisis and causing political and economical instability and social unrest in both poor and developed nations. Systemic causes for the worldwide increases in food prices continue to be the subject of debate. Initial causes of the late 2006 price spikes included droughts in grain-producing nations and rising oil prices. Oil price increases also caused general escalations the costs of fertilizers, food transportation, and industrial agriculture. The Global Financial Crisis has been called the worst financial crisis since the one related to the Great Depression of the 1930’s. It contributed to the failure of key businesses, declines in consume wealth estimated in the trillions of US dollars, substantial financial commitments incurred by governments and a significant decline in economic activity. The collapse of the global housing bubble, which peaked in the US in 2006, caused the values of securities tied to housing prices to plummet thereafter, damaging financial institutions globally. The Supreme Court of Sri Lanka annulled the highly controversial privatization of Lanka Marine Services (LMS) in its ‘landmark’ 21 July 2008 judgment. The Court found the privatization to be fraudulent in which John Keells Holdings (JKH) Chairman Susantha Ratnayake and Treasury Secretary P.B. Jayasundera were said to have acted in concert in the corrupt deal. Dr. Jayasundera eventually resigned from his position as Treasury Secretary after the Court found him unfit to hold public office. However, he once again assumed duties in 2009 after a seven-judge bench was convened to hear his case to re-enter public office. Mr. Ratnayake remains as the Chairman of JKH. Lalith Kotelawala who with Harry Jayawardena are arguably the most wealthiest men in Sri Lanka today, was arrested and remanded after his company, Golden Key Credit Card Co collapsed, leaving thousands of depositors in the lurch. The collapse triggered a crisis in all the Ceylinco Consolidated companies and a run on the deposits in its finance and real estate firms. The Central Bank came to the rescue of these firms and handed them over to other companies. Kotelawala’s wife, Sicille is on the run somewhere in Asia or Europe and has been listed by Interpol as among the most wanted in Asia. Cases of fraud against Kotelawala and his co-directors are ongoing. 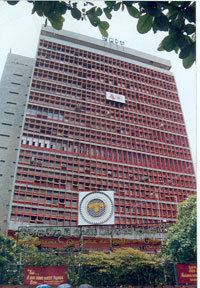 The Sri Lanka Insurance Corporation (SLIC) privatization was annulled by the Supreme Court in June 2009. The transaction was entered into in 2001 between the government of Sri Lanka and a consortium of companies led by businessman Harry Jayawardena. In the judgment, the Court ordered that the 90% stake in SLIC be returned to the Treasury and the Rs.6 billion purchase price be repaid to the buyer.